Last year I enjoyed the playing of the double bassist Olie Brice in several contexts, notably the excellent quartet of the trumpeter Nick Malcolm. Now Brice has an intriguing band of his own, and they launched their new album with a gig at the Vortex on Tuesday night. On the CD, called Immune to Clockwork, Brice’s quintet is completed by Alex Bonney on trumpet and cornet, Waclaw Zimpel on alto clarinet, Mark Hanslip on tenor saxophone and Jeff Williams on drums. The instrumentation, and the strong commitment to collective interplay, remind me at times of the occasions on which Ornette Coleman led a band with both Don Cherry and Dewey Redman in it (e.g. the Crisis album), of the New York Contemporary 5 (with Cherry, John Tchicai and Archie Shepp), and occasionally of Albert Ayler’s Bells/Spirits Rejoice quintet. But that doesn’t mean they sound like those bands. This isn’t a ’60s thing in any sense. Brice’s thoughtful compositions and the high-grade improvising of all the individuals see to that. The leader and his musicians certainly make use of the freedoms that were fought for in the ’60s. But they don’t share the social environment and conditions in which Ayler, Shepp and the rest worked, and they don’t try to counterfeit its effects. Their music works so well because it has a very different flavour: the textures are gentler, the attack less aggressive and more measured. The compositions, employing a welcome variety of techniques (including a Mingus-like fondness for loosely plaited horn lines) within a clearly defined emotional range, are more reflective in tone but encourage the individuals to listen and react to each other with just as much intensity. The result is music than cannot be defined by era, its own or any other. 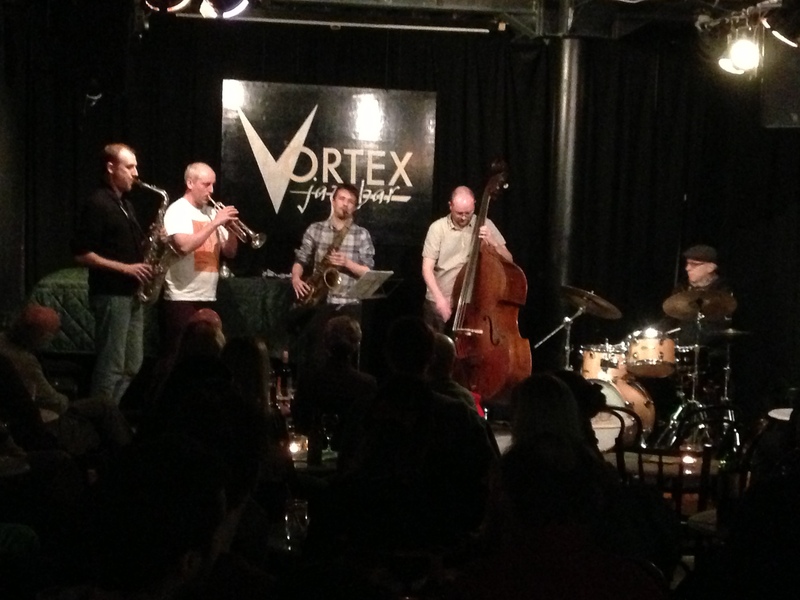 At the Vortex, Zimpel and Hanslip were replaced by Mike Fletcher and George Crowley, with no loss of quality. Zimpel’s alto clarinet and Fletcher’s C melody saxophone give the ensemble a subtly unusual blend: the latter horn, fairly common in pre-war dance bands but now seldom seen, could be described as sounding like an alto after a quarter-bottle of brandy, its voice slightly deeper and hoarser, although still lighter than a tenor. I could only stay for Tuesday’s first set, but that was more than enough to confirm the strongly favourable impression made by Immune to Clockwork (which is released on the Multikulti Project label). A playful version of “If You Were the Only Girl in the World” — a First World War song which the young Brice heard his grandmother sing, later discovering to his delight that Sonny Rollins had recorded in 1958 (in a trio version with Henry Grimes and Specs Wright) — lightened the mood set by something like the skittering Ornetteish lines of “Crumbling Shyly”. The leader introduced a slow piece called “What Might Have Been” with a well constructed and emotionally compelling solo that showed how artfully he has reconciled the salient characteristics of Mingus and Charlie Haden in order to emerge with his own voice. Joined by the discreet but inspiring brush-work of the impeccable Williams, he was able to provide a sensitive framework within which Crowley and Fletcher could display their imagination and character. There a track from the album, called “The Hands”, currently on Soundcloud (you’ll have to scroll down a bit). It’ll give you an idea of why this quintet, which stays resolutely clear of empty displays of spectacular technique, has become one of the most interesting and satisfying bands on the current UK scene.